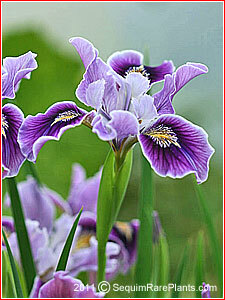 We offer potted plants of these irises for spring planting. 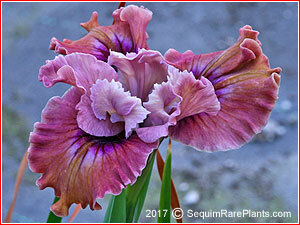 This page contains hybrids of irises that are native to northern California and southern Oregon. 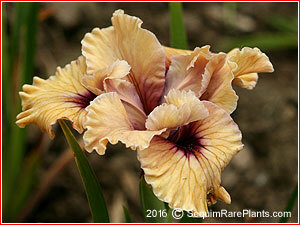 They are best grown in soil that is acid, such as soil amended with a generous amount of humus or well-rotted compost. Filtered light or partial shade is best in most gardens, especially when grown in climates different from their native range. Mulching during winter is recommended where winter climates are more severe. 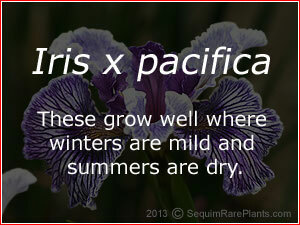 Best grown in gardens along the Pacific Coast. 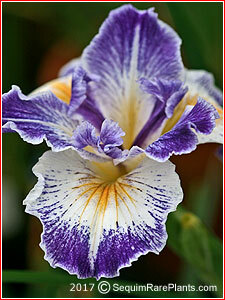 $9.95 A plicata of white with blue stitching, and dark purple styles in the center. $9.95 A plicata of gold, edged in reddish-brown. 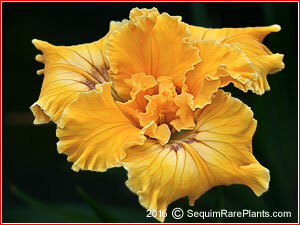 $9.95 Wide, ruffled petals of golden yellow, lightening towards the heart of each petal. Lightly veined. $9.95 A blend of tawny rose and gold. Chemeketa is originally a word from the aboriginal Kalapuya natives near Salem, Oregon, meaning "place of peace." Today there is a community college in Oregon with this name, in addition to a location in California named Chemeketa Park. $9.95 A pure, solid gold, that is ruffled. $9.95 Lightly rosy-tannish wine, nicely ruffled and spreading. 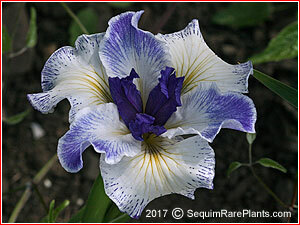 $9.95 Three colors -- golden at the base, creamy white in the center and a wide splash of purple at the tips of the falls. 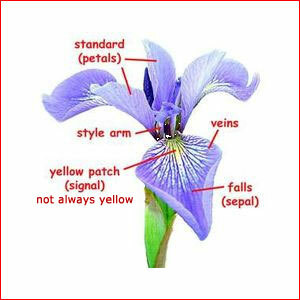 With veins standing out in gold and purple. $8.95 Very colorful in rich purple and lighter lilac. 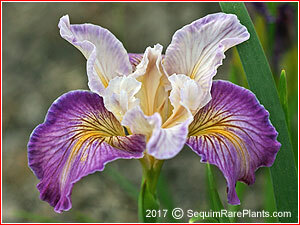 It is named for a famous garden in California. 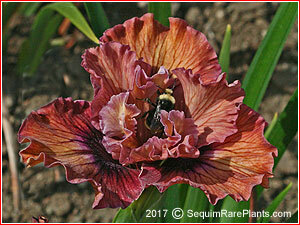 $10.95 Fireflow' has ruffled flowers of a very dark blood red surrounding a golden center. 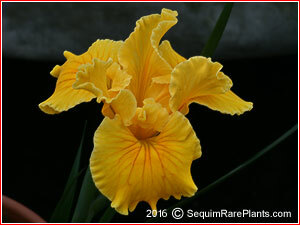 The petals and sepals are partially edged in a thin line of gold. $9.95 Combines falls of medium lavender-blue with a very ruffly center buff of lighter standards. 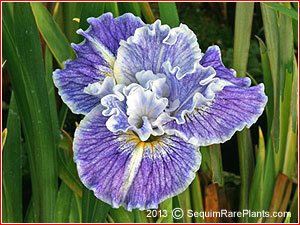 The lavender-blue falls are colored lighter at their edges, and have a creamy center line. $9.95 Medium to light lavender-pink. 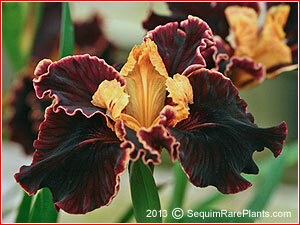 Dark wine signals and ruffled edges. $10.95 Dusky rose blended with amber on the falls. 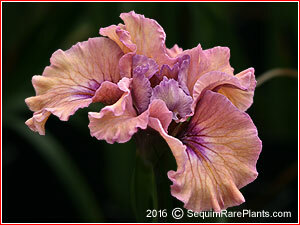 The standards and styles are a lighter, creamy lavender-pink. $9.95 The falls are lavender-rose. 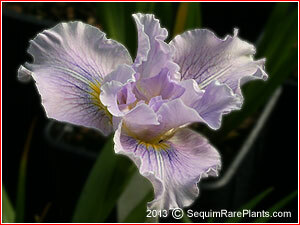 The flaring, upright standards are a contrasting cream, lightly touched in lavender. 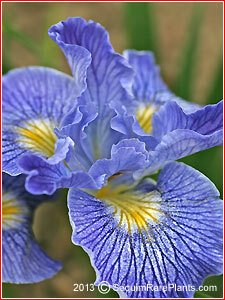 $9.95 'Ocean Blue' is mostly a light lavender-blue, close to a sky-blue. Darker veins run through the falls, and each has a golden signal at its base. 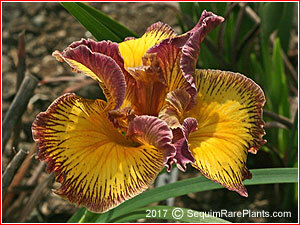 $9.95 Light peachy yellow with a dark maroon signal at the base of each petal. Ruffles on the petals' edges. $9.95 Creamy white flowers with just a hint of very light blue towards the edge of the falls. Nicely ruffled. 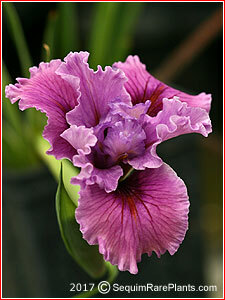 $8.95 Ruffly flowers of cream to a very delicate lilac, blushed a bit darker towards the inner part of the falls. 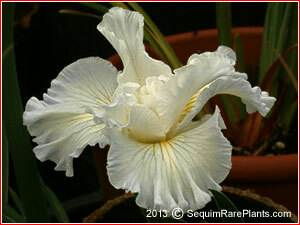 This is unregistered with the American Iris Society. 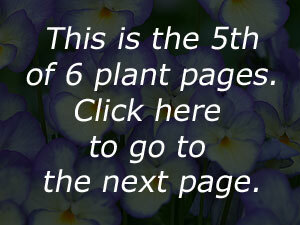 Click here to go to page 6.